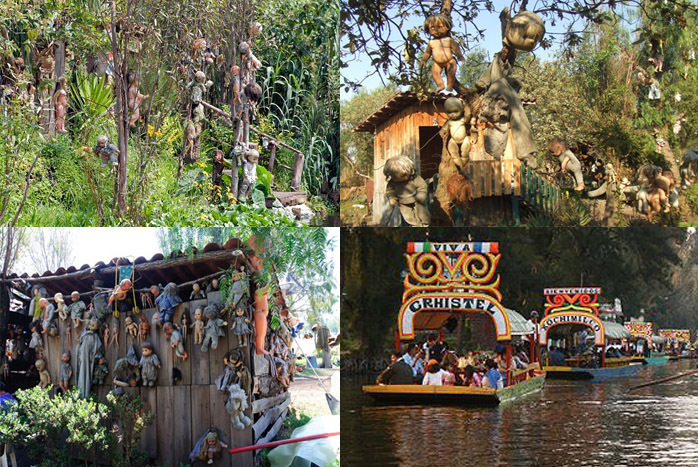 The Island of The Dolls (Islade las Muñecas), located in the vast network of canals that lies to the south of Mexico City, near Xochimilco is one of the creepiest tourist attraction in Mexico. Here, among the branches and dead trees hang hundreds of old, mutilated dolls. The story goes that some half a century ago a little girl drowned off a small island hidden deep amongst the canals of Xochimico. The island’s only permanent inhabitant was a hermit named Don Julián Santana Barrera, who despite having a wife and family, chose to live alone on the island. Soon after the girl’s death Barrera fished out one doll after another from the canals. Convinced that this was a sign from the evil spirit, Don Julian Santana began hanging them on trees to protect himself from evil and calm the spirit of the dead girl. Soon Don Julián had made the entire island into a shrine. Santana did not clean up the dolls or attempt to fix them, but rather put them up with missing eyes and limbs, covered in dirt. Even when dolls arrived in good shape, the wind and weather naturally decomposed them over time creating a gallery of eerie and ghoulish faces. As well as damage from the sun – which leaves many of the dolls covered in bubbles, blotches and blisters – the wind and rain have also left their mark, eroding any surface paint and leaving behind pale, skull-like faces, or gradually gnawing away the dolls’ fake hair to create jagged tufts that make them look as if they’re suffering from an agonising wasting disease. Many are also missing arms or legs – or have been given the limb of another doll that clearly doesn’t match – and even toys without heads are welcome on the island, many strung from washing lines or shoved into the gaps between branches, their exposed necks becoming a home for the exotic spiders and insects that inhabit this sprawling agricultural region. Don Julian Santana lived on the island for 50 years before his death in 2001. He was found drowned in the same area in which he believed the little girl had died.